NOTE: This is an ongoing project and I will be adding more content weekly. When I am done I will remove this text. In addition, I am jumping around on this project,. putting in entries when they inspire me. Therefore you wont be able to read it in its entirety until I am finished, but you may jump to the sections that are already done. Enjoy! The Resolute War began in the year 2368 AD and came at a time when Romulan Empire had just completed its newest update of warships (the D'deridex II-class), but the United Federation of Planets (UFP) was poorly prepared for combat, while the Klingon Empire fared only moderately better in ships and morale following the end of their recent Civil War. 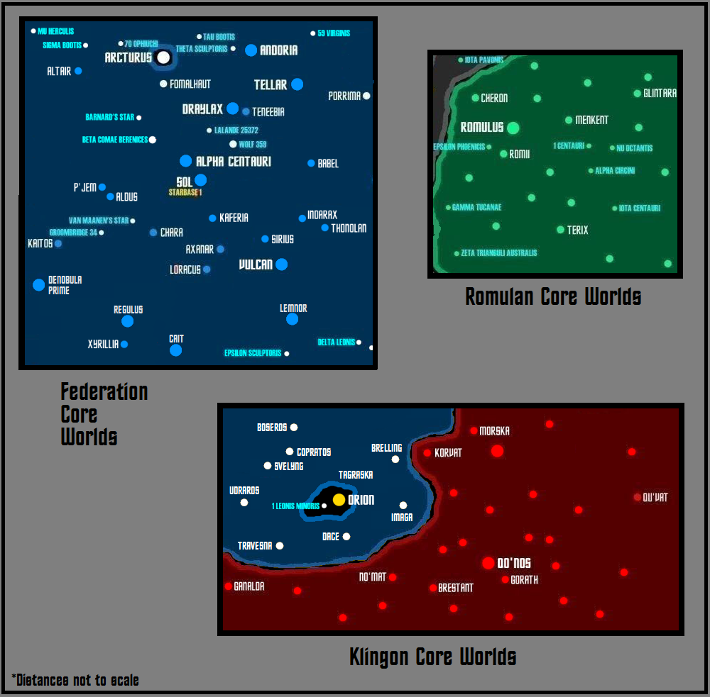 This all-out war between the Romulans and the Federation-Klingon Alliance started just a few years after the conclusion of the UFP-Cardassian War, when most of Starfleets' fighting ships were badly out of position, guarding the newly created Demilitarized Zone border region on the opposite side of Federation space. However, the top brass on Earth had (over the years) prepared for many critical plans for warfare, and war with the Romulans was one such contingency. 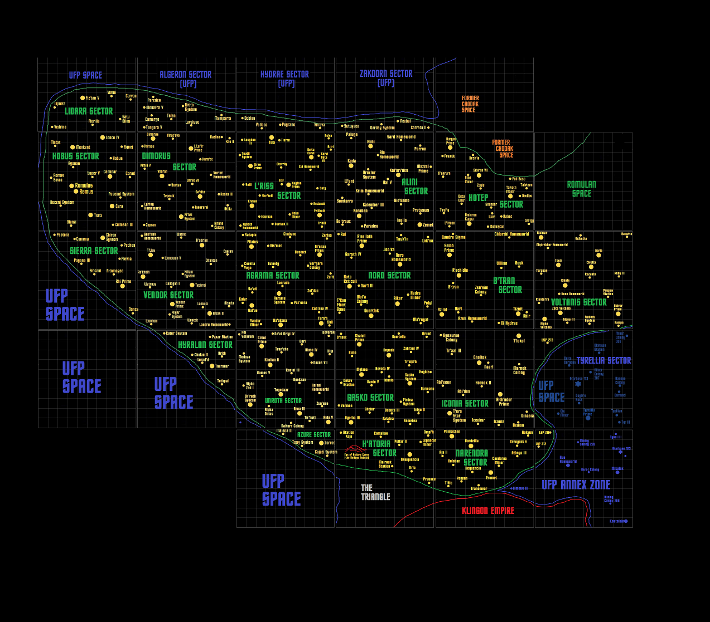 The United Federation of Planets has continually grown since its creation, and in 2330 AD a new special "Annex Zone" had been created on the far side of Klingon and Romulan space, allowing for additional UFP colonization and exploration. This area had previously been ignored by both Romulus and Qo'noS mainly because it had very few planets, and neither Empire wanted to increase points along the border with each other if they could help it. Luckily, this made for a ripe opportunity for the Federation as it increased contacts in the region with local alien races, bringing them into the UFP. 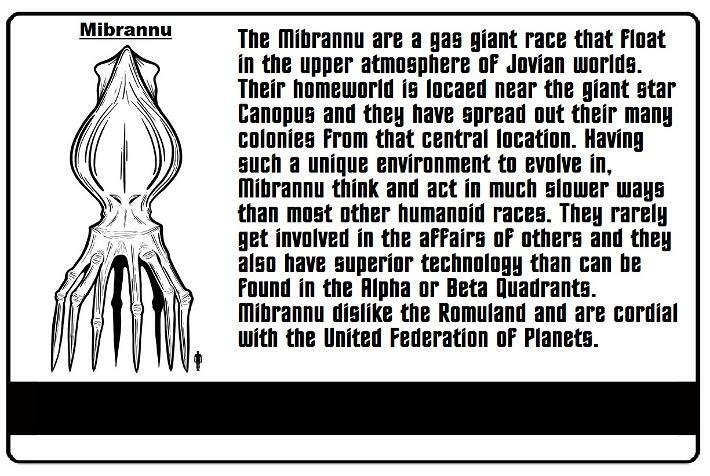 These races (the Mikulaks, the Hus, and the Mibrannu) contributed recognizable improvements to UFP sciences, especially in the area of biosciences in the case of the gas giant-dwelling Mibrannu. Starfleet defenses in this "Annex" region were slowly built up over time to avoid alarming either the Klingons or the Romulans and included the Starbases 36, 117, 173, 13, the huge Canopus Fleet Base, and the Gallipoli Defense Station (which was created as a enormous weapons depot and military staging area for Starfleet in case of war). Ironically, half a dozen serious incidents between the Federation and Romulans had crept up over the years, and began to alarm senior UFP civilian and military leaders. These events included the destabilizing Romulan intervention into Federation space (Dubhe System), the crisis over the diplomat/defector T'Pel, and the more recent attempted military unification of Vulcan with the Romulan Empire in 2366 AD. While the Federation usually prevailed in these dangerous situations it became very apparent that the leaders on Romulus would be pursuing an extremely aggressive form of diplomacy and expansion, costing the UFP much time and money to counter. With these growing incidents in mind, Starfleet had wisely began a covert military build-up in the Annex several years prior to the three-way war we now know as the Resolute War (a six year conflict). Unfortunately for the UFP and Klingons, the situation with Romulus deteriorated much too quickly when the the Neutral Zone Crisis of 2368 AD broke out. The destruction of the Federations' premier vessel (the USS Enterprise-D) at Nelvana III was a shock to Starfleet and although survivors were repatriated through Klingon space, heads were demanded on Earth over the incident. At the time, the Enterprise has been lured into the Neutral Zone by supposed Romulan incursions but Starfleet Captain Jean-Luc Picard had wisely obtained several cloaked Klingon vessels as escorts into the disputed region. When two Romulan battleships decloaked around the unclaimed planet Nelvana III, a wild melee of combat ensued between the joint Alliance forces and the Romulans. Only one badly damaged Klingon ship survived the battle and alerted their homeworld to the Romulan sneak attack, outraging the High Council on Qo'noS and beginning an all-out war that would eventually see the conquest and total dissolution of the Romulan Empire. This conflict is described more in depth below. To fully comprehend the Resolute War, there needs to be an understanding of Klingon psychology as well as Federation diplomatic commitment. When the Romulans attacked the joint Federation-Klingon group of starships at Nelvana III, they began a series of catastrophic decisions that resulted in the complete occupation of the Romulan Empire in just six years. The initial battle in the Neutral Zone incensed the aggressive Klingons, who believed strongly in an eye-for-an-eye and a-tooth-for-a-tooth. Throughout its long history as a star-spanning empire, the Klingons were at one time or another engaged in all-out combat with most of its neighbors, including in at least 3 separate occasions with the Romulans. The Klingon mental state demands respect and at least the acceptance of their dominance and strength as superior than any other races, and to challenge these facts would ensure a violent response by any member of the bumpy-headed race. The sneak attack in the Neutral Zone deeply angered the Klingons and the all-out war began just a few weeks later as Klingon Frontier Fleets lunged across the joint border and engaged defending Romulan forces. 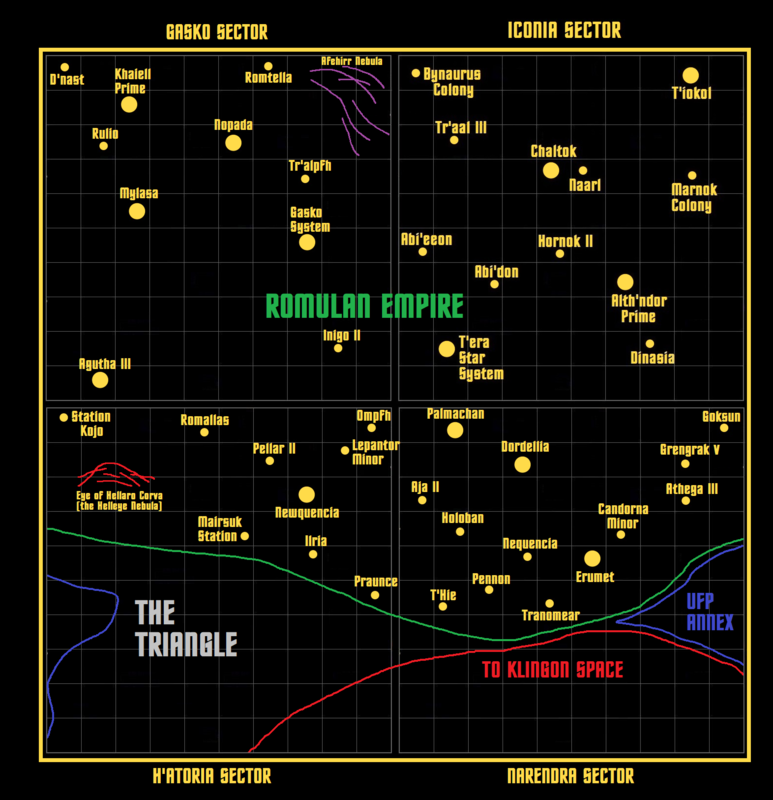 The Romulan areas adjacent to the Klingon Empire were contained mostly near the Triangle and the Narendra Sector, and that is where the first brutal starship fighting of the Resolute War took place. At least three dozen large Klingon fleets entered Romulan space in the latter part of 2368 on the orders of the Klingon High Command and newly-installed leader Chancellor Gowron: he was energetic about the coming conflicts against their pointy-eared neighbors. To the Klingons, winning in combat brings enormous glory to the military leaders and their houses, which make up a significant part of the Klingon Empire and while they were caught off guard at the initial point of conflict, the Klingons made excellent use of their time and invaded immediately. 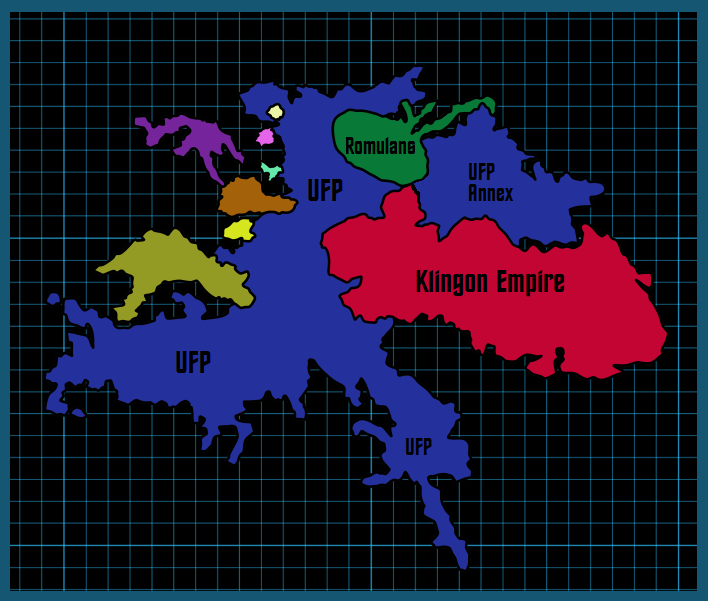 The United Federation of Planets was economically and militarily allied to the Klingon Empire in what was known as "the Alliance". This pact was formed after many generations of distrust and occasional combat between the two galactic powers but in the end it was the Romulans that foolishly caused the forging of the Alliance, and their doom. 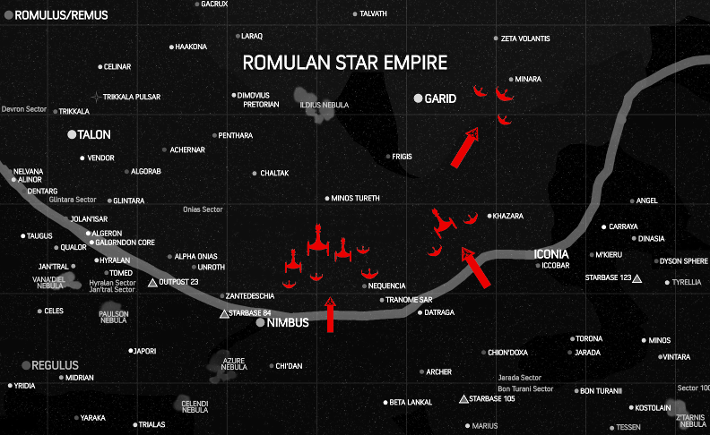 Over 20 years ago the Romulans decided to test the battle-strength of the Klingon Empire; the borders had been quite for decades and the leadership on Romulus was restless for some warmongering. A sneak raid into the Narendra System on the Klingon side of the border by four Romulan warbirds caught the defenders by surprise and the local defensive warships were quickly wiped out by the attackers, who proceeded to bombard the planet from orbit. 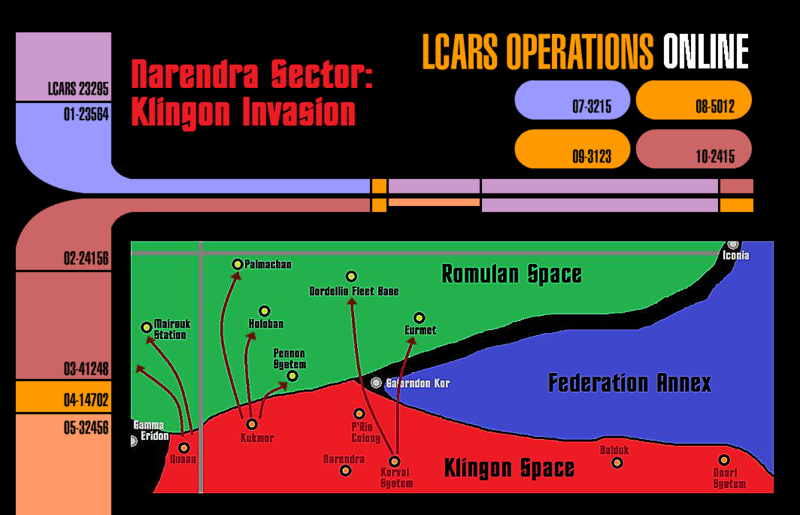 The Narendra III outpost was a minor Klingon colony that was wholly unable to hold off the invaders but they sent emergency signals out, hoping for a rescue from certain death. In a stroke of luck, the Federation starship USS Enterprise (NCC-1701C) was nearby and answered the distress call but the ship was badly outnumbered by the Romulans and in a heroic battle the Starfleet starship was destroyed defending the Klingon civilian colony at Narendra. This moment of bravery on the part of the Federation was seen as a significant act by the Klingon Empire, which began negotiations that led to a permanent peace and fragile but growing alliance between the two stellar nations. Since that time, the Alliance had decades to strengthen and when the Romulans attacked in the Nelvana System in 2368, the political and military leadership within the United Federation of Planets was willing to stand by its treaty obligations with the Klingons, and declared war on Romulus two months later. The Federation normally is loathe to get involved in military conflicts as they usually resolved nothing, but to honor their word with the Klingon Empire was a vital step in maintaining the Alliance and Starfleet forces moved to support the Klingons as they advanced into Romulan space. 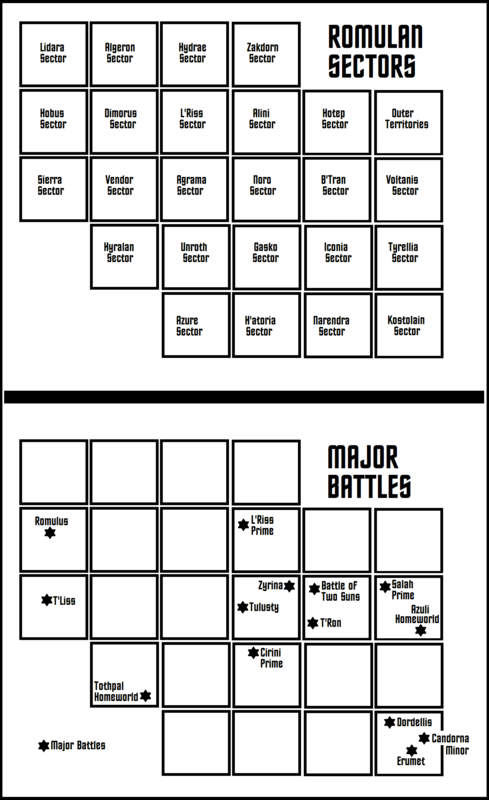 The first several battles in this new war took place all along the border between the two Empires, mostly in deep space and won almost every time by the aggressive Klingons. 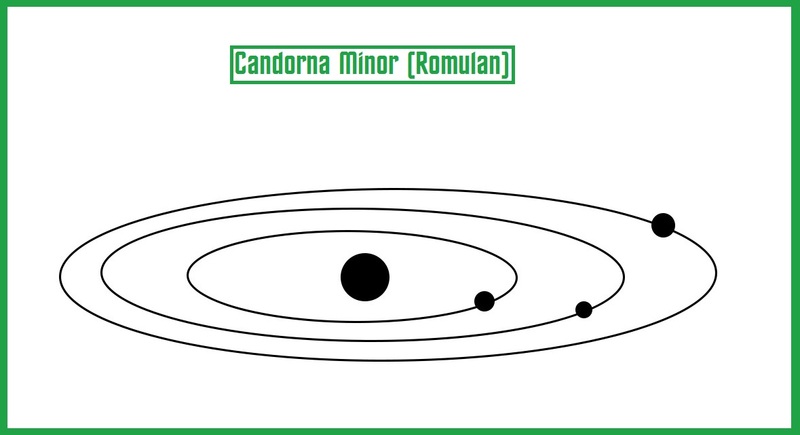 The first planetary incursion in the war too place in the Romulan system Erumet, which was a border world with a significant civilian population and large ship yards. Klingon intelligence held that only a few Romulan capital warships were defending the system so four dozen capital ships were sent to crush the enemy forces and capture the system. Unfortunately the intel about Erumet was only partially correct and the Klingon Third Fleet ran into a massive wall of steel when they encountered the non-warp capable "monitors" that the Romulans had constructed in many of their border worlds. These monstrosities were unable to leave the system they were built in but in replacing their warp drive and engines with stronger weapons and additional armor and shields, the Romulans created an extremely effective (and deadly) warship; a foe which the Klingons were totally unprepared for. These System Defense "Monitors" were built in secret by the Romulans in the preceding 10 years and dozens of them were fielded in its border systems. These enormous warships were fast and could utilize the advanced Romulan cloaking device, but they maneuvered like a drunken pig and that was their only true weakness. Without the need to feed a power-hungry warp drive, these vessels were able to shunt a great deal of energy into their offensive weapons, which nearly doubled the output of their bug guns. 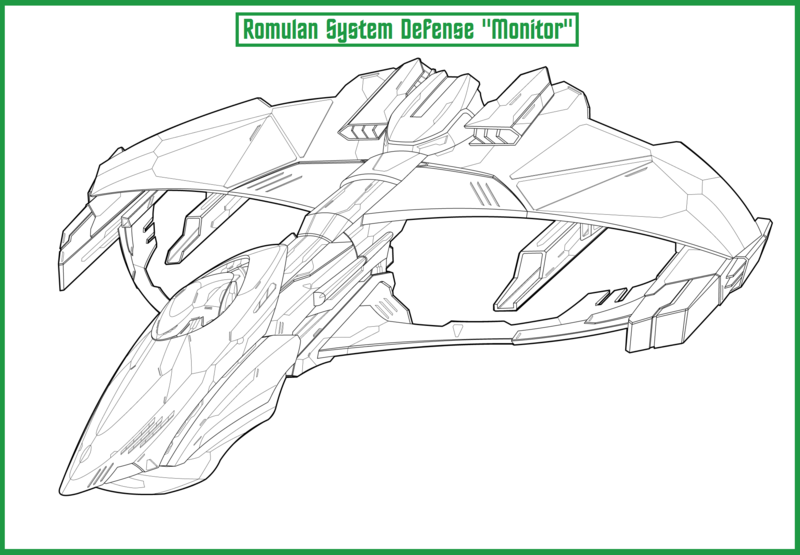 In combat, just a few hits by a Romulan monitors' weapons could destroy an entire warship, and its armor and shields effectively protected it from return fire by the enemy. In the Eurmet System, six of these warships were able to destroy or badly damage 22 Klingon cruisers and destroyers before being overwhelmed. Data collected from the battle was sent to all standing Klingon forces along the front line as well as to Qo'noS and the Federation but it was too late for some invading Alliance forces and in less than 2 week nearly 80 Alliance capital ships were destroyed by these Romulan System Defense Monitors. Studies at the end of the war concluded that these stupendous monstrosities where very effective in their role as defenders, but the lack of warp drive crippled any option of retreat and Alliance forces never duplicated the Romulans efforts in this area. It was during these initial military thrusts into the southern flank of the Romulan Empire that Starfleet began its operations. Staging out of the small but adequate Starbase 173, the Federation had consolidated the 14th Fleet from nearby deployments and rushed them forward into battle under the veteran Vulcan Admiral Sortal. With over 40 vessels at his command, Sortal made his move in support of the Klingons into the Erumet System in December 2368 and helped secure the system by destroying the various orbital defenses that the Romulans had emplaced. The 14th Fleet had missed the initial attack into the system by the Klingons and their desperate charge against the defending monitor-class Romulan vessels, but UFP forces began mop-up operations in earnest that same month and moved onto other targets of opportunity by Christmas. In addition, the Klingon Empire finished its first Or'Loth-class battlecruiser and rushed it into action in that same month. 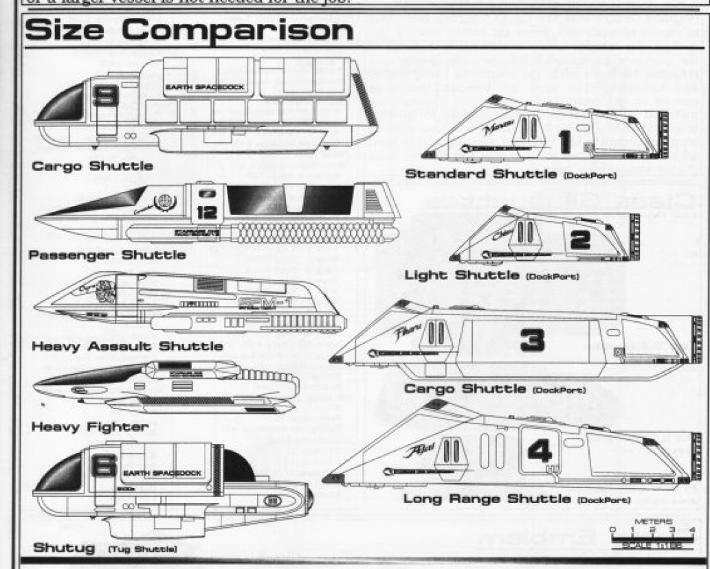 While lagging on the drawing boards for years, the Klingon High Command could never come up with a finalized design and the first initial six space frames were stored in orbit in the Noarl System. The outbreak of war between the Romulans against the Klingons and Federation forced local commanders in Noarl to prioritize the Or'Loths and send them into battle as quickly as possible. 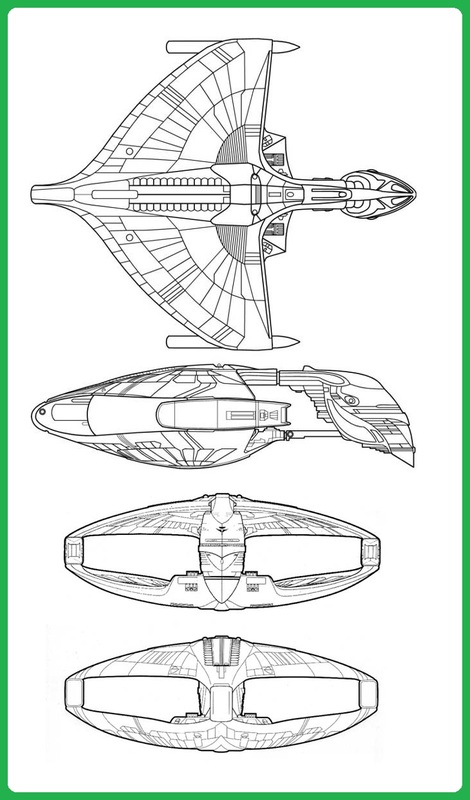 Providentially, this warship design was extremely effective in combat, using the Klingon's newest cloaking technology to its advantage, as well as its new high powered "double-disruptors". In the first 3 months of combat in Romulan space, the Or'Loth-class battlecruisers proved their value on the battlefield and eight dozen more were ordered for the Klingon Navy in late 2368. These battlecruisers' were designed and weaponized by the House of Kozek, a minor but growing house within the Empire. Shortly before the outbreak of the Resolute War, the enigmatic race known as the Mibrannu was being courted by the United Federation of Planets to join that organization. They had evolved inside a gas giant and had spread across a wide area of space around the giant star Canopus in the Annex region. One of the main reasons the Federation had been pursuing contact with the Mibrannu was their fantastically advanced biological engineering, especially their medical nanite technology. Negotiations had proceeded well until war was thrust upon the region, making the Mibrannu extremely nervous. With their superior technology, these gas giant aliens believed they could hold off an attack by the warlike Romulans but during their most recent talks they asked for Federation reinforcements to their homeworld, which held over 80% of their total population. If their pointy-eared neighbors did attack, the Mibrannu colony worlds would be sacrificed to protect the majority of their race (this never happened). Starfleet quickly approved the request and the combat experienced Task Group 117 under Vice Admiral Vorix was dispatched along with a dozen vessels, including his Excelsior-class command ship, the USS Valley Forge (NCC-43305). This small military formation had seen dozens of actions during the recent Cardassian War and was well-equipped both in personnel and arms to protect the new fledgling member of the Federation. 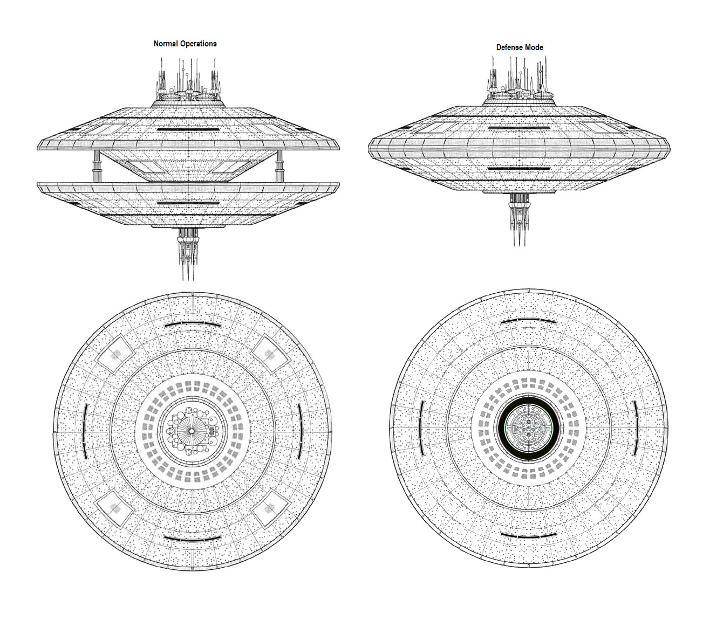 Additional Starfleet reinforcements into the Annex region were with the new Frontier Strike Cruiser, a regional command ship that was equipped to handle the massive information influx of interstellar war. 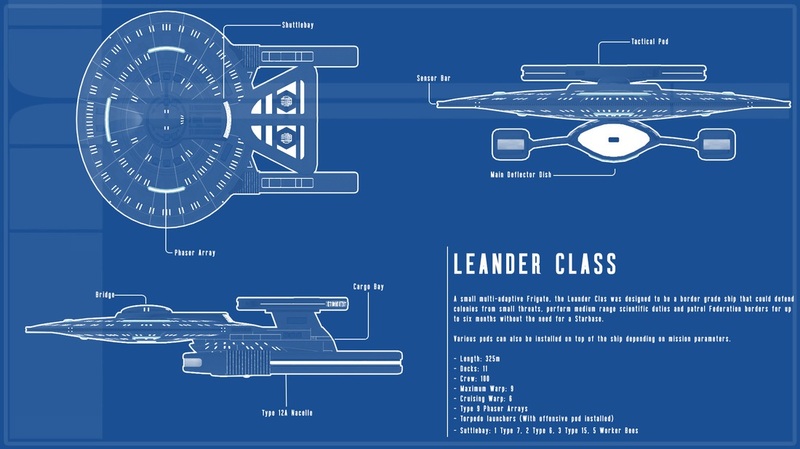 These vessels became the core of several Federation battlegroups, with the first three vessels being the USS Laurentian Shelf, the USS Shield, and the USS Northern Lights. 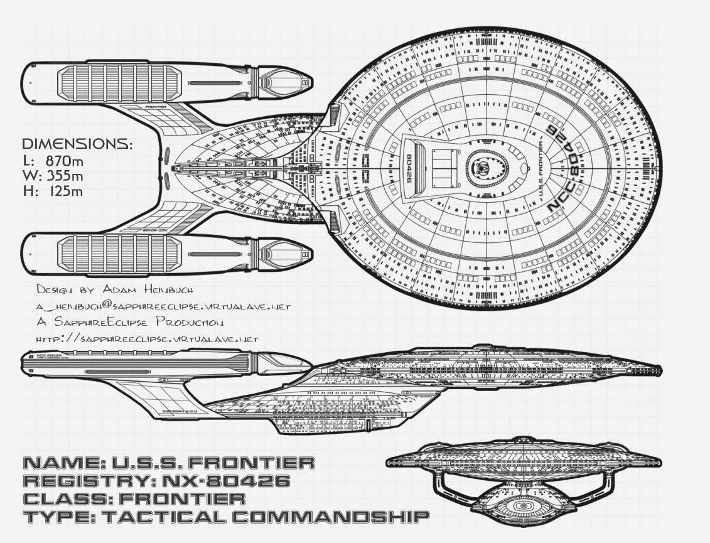 Built from the ground up as a command ship, the Frontier-class were heavily armed and very capable of running fleet-wide operations due to several large sensor and communications arrays built into the ship. At the center of the upper sauce section was an extremely large and well-appointed combat information center (CIC), staffed with seasoned and proficient command personnel. 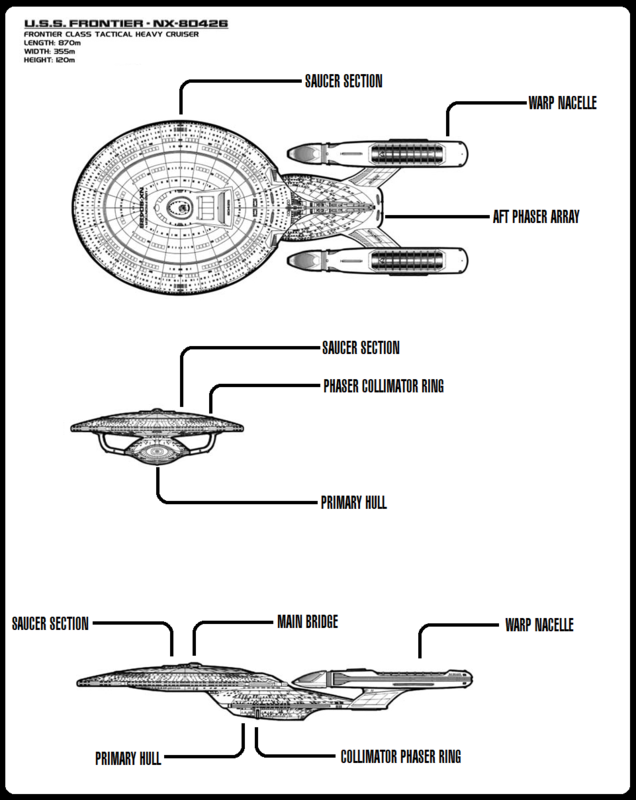 These tactical command vessels enabled Starfleet's local forces to combine their sensors and other abilities in ways that normal scientific and exploration vessels could not. 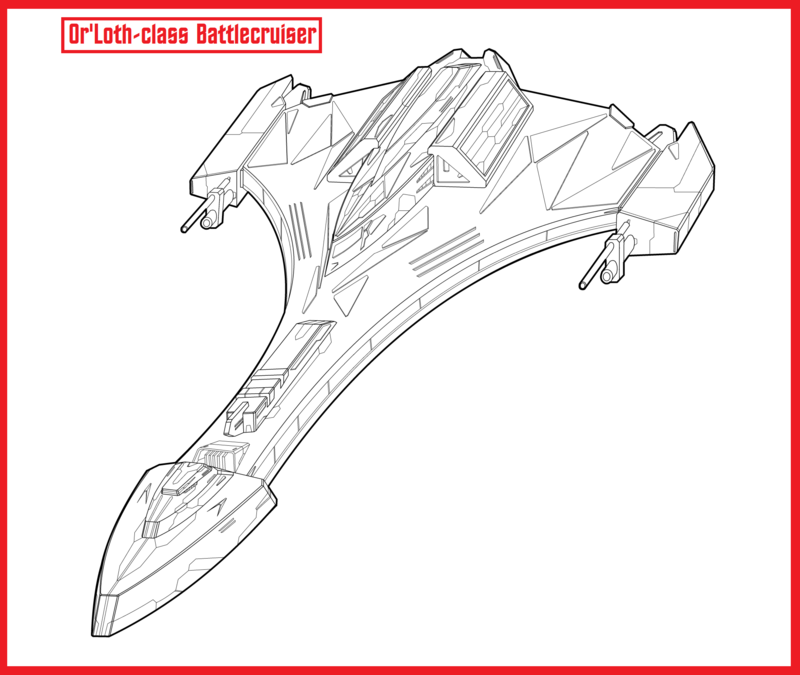 More than two dozen of the Frontier-class was built during the war and they went on to become a successful and widely manufactured class, with over 50 being finished before the Dominion War began. They also fielded Starfleets' first heavily antimatter-laden "warp torpedoes", weapons which could be fired up to a light year away and move at high-speed towards their target. These torpedoes were first used in the Battle for Candorna Minor, a Romulan world along the border. These new torpedo prototypes had been captured by the USS Zeus (NCC-4466), Starfleet's newest dreadnought, and the USS Enterprise (NCC-1701D) during an emergency military situation in the Dubhe System. 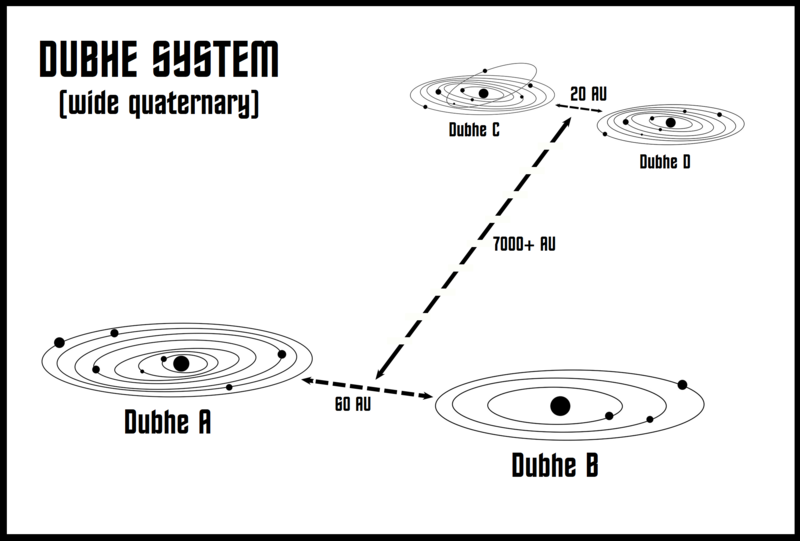 The Dubhe System (located deep in Federation space) contained dozens of planets: the system is made up of four co-orbiting stars. Seven of these planets are habitable and are either Federation Members or Associate Members. The critical situation arose when the Warlord of Han Kao, perceiving an imminent economic boycott by the other Dubhe member planets, opened fire on all spacecraft orbiting within the Dubhe System. This system-wide attack crippled the Excelsior-class starship USS Fearless (NCC-4598) that was patrolling the region and killed over 200,000 civilians across the entire area. The Warlord further threatened to fire his more powerful "warp torpedoes" at the other member planets if Han Kao's economic issues were not addressed. The USS Zeus and USS Enterprise rushed to the scene in an effort to avoid civil war within the Federation and Captain Jean-Luc Picard and Captain Ryan Farris (of the USS Zeus) discovered the Romulans were behind the plot after four warbirds decloaked and opened fire at the height of the crisis. In the ensuing conflict both Starfleet vessels were moderately damaged but they won the battle. Several of the enemy's warp torpedoes survived the battle and were taken to the Antares Testing Range for evaluation, where they were eventually duplicated by Starfleet weapons specialists. Though classified, a typical warp torpedo's firepower is thought to be three to five times that of a normal photon torpedo because of its extremely large antimatter warhead. Production of these warp-capable heavy torpedoes is now well underway, for both starship and planetary defense use within the Federation. While Starfleet moved to protect the Mibrannu homeworld, it also sent a small task force under Commodore Jon Allenby to the Hus System. 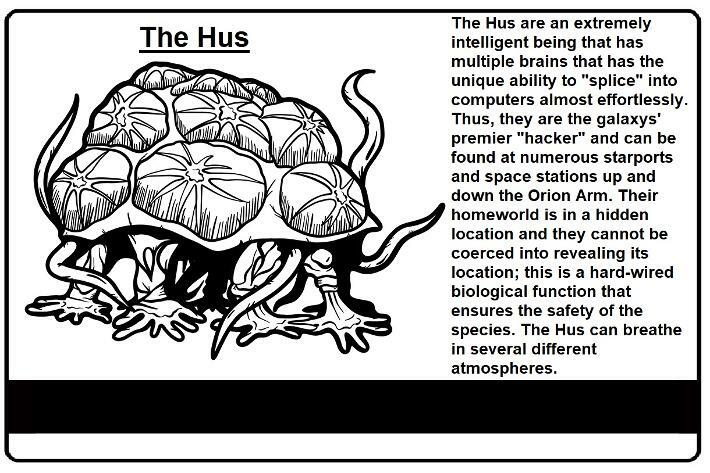 The Hus are a non-humanoid alien species that had been negotiating to join the Federation for several months. The Federation Council wanted to ensure that the talks were successful and ordered Starfleet to send forces to protect the system from possible Romulan counter-attack. Four starships, including two brand new Leander-class border-patrol frigates that were heavily armed with over 500 photon torpedoes mounted in a large tactical pod located above the ship. These two ships, the USS Colville and the USS Burns, were field tested and proved effective during their six month tour of the Hus System. 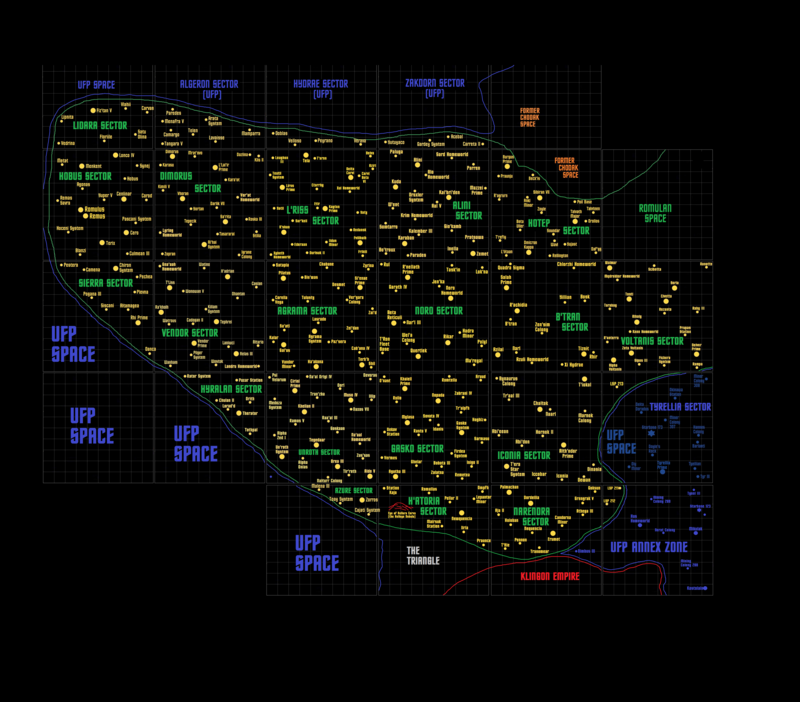 When the United Federation of Planets began to explore and colonize the new Annex region, it quickly realized that Starfleet would have a difficult time defending the area if it didn't emplace several depots in strategic spots. 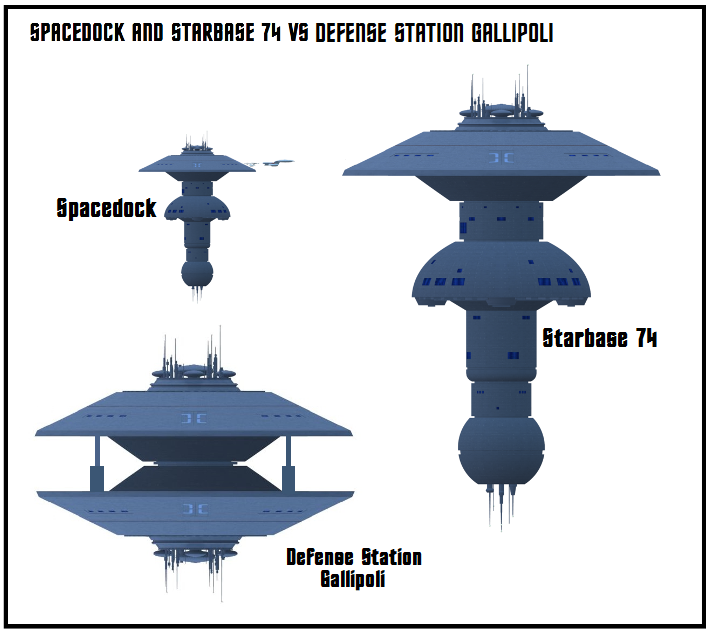 One of these was Defense Station Gallipoli, a massive military-grade starbase that was run by Starfleet Command and finished in under 2 years. This behemoth warstation was designed with combat in mind and could "close-up" by shutting its clam-shell like sections. Armed with a huge array of advanced phasers and torpedoes, Gallipoli could hold off a attacking enemy fleet on its own. It was stocked with a large array of supplies and smallcraft, able to repair and replenish a dozen starships at once deep inside its secured armor exterior. Staffed by over 40,000 personnel, including 8,000 Marines, the defense station was hidden in a small burned-out red-dwarf star system near the star Canopus and was designed as a forward staging point for any military operations that Starfleet would enact specifically against the Romulan Empire. Gallipoli also fielded an impressive array of new automated weapons that could defend the station and over 2000 smallcraft were stockpiled there as well, including a vast number of shuttles and other small cargo craft. When the Resolute War began, the local Starfleet vessels in the sector relocated to Defense Station Gallipoli and formed the 12th Fleet under Admiral Carlos Rota. 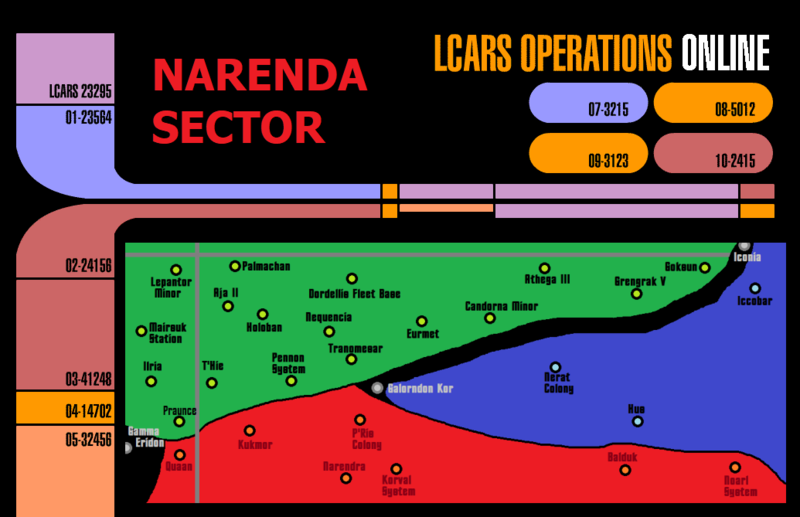 This forced eventually moved into Narendra Sector in support of Klingon fleet operations there, and then began the invasion of the Romulan Iconia Sector, and later the Voltanis Sector, both of which were within easy striking-range of the starbase.